Home Dumpster Rental News How Much Does It Cost To Rent A 10 Yard Dumpster? The rental cost for a 10 yard dumpster can run anywhere from $250 – $400, depending on the region or dumpster rental service. Same Day Dumpsters offers a 10 day rental period for $275. Be sure to call around to different companies and compare prices to find the best deal for you and your project. A 10 yard dumpster holds 10 cubic yards of debris. That would equate to roughly 3 to 5 pick up truck loads, depending on the size of the truck and the amount you can cram in it. A 10 yard dumpster is best used for residential and commercial needs and is ideal for smaller projects or renovations. The most common types of 10 yard dumpsters are the lowboys and those with a single hinged door allowing easy access. Lowboys simply have shorter sidewalls to make heavy debris easier to load instead of a hinged door. 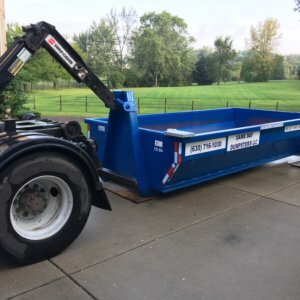 This type of bin is perfect for smaller projects with heavy debris and your local dumpster rental company will put protective wood between the container and your driveway to guard against scrapes and damage. Ask the company before you book a rental to make sure they will do this for you. What Kind of Projects Would A 10 Yard Dumpster Handle? A 10 yard dumpster can be used for smaller residential or commercial gigs. Here is an example of projects in which you would use this size dumpster. This is not a complete list of uses for a 10 yard dumpster but several examples to demonstrate the capacity of the container. How Do I Know If I Need a 10 Yard Dumpster? There are many types of rubbish aside from the ones listed above that you can load but be cautious not to put hazardous materials or prohibited items in your dumpster rental. Inquire with your dumpster service about working with heavier debris, such as sand or concrete, because they might waive weight allowances and simply have you fill it to a specific height. Be as detailed as possible when speaking with your dumpster rental company to accurately assess the correct weight you will need. If you go over the weight limit listed on the dumpster, you will be charged an overage fee per extra ton. Watch out for others using your dumpster illegally. This can add bulk to your dumpster and cause you to exceed your weight limit. Here is a list of ways to prevent criminal dumping. Be sure to contact your village/town hall and ask if you need a permit for your dumpster and if there are any codes limiting the amount of time you can have one on your property. 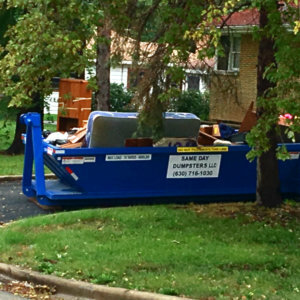 There are certain things you should consider before you hire a dumpster rental service. The company should care about your concerns and project needs so make sure you look into their customer service and reviews. You can check out Google reviews about them and some companies will even have testimonial sections or case studies on their site and social media. If you are still unsure, call them. You can gauge a lot about how a company runs by how they respond to you, answer your questions and fulfill time commitments. If You Are Unsure Of How To Rent A Dumpster Or What Goes Into It, Follow These Step-By-Step Instructions.